For 1957, Chrysler’s “Forward Look” styling theme had fully taken hold among the company’s automotive line, so it was time for the trucks to join in. Ahead of the cab, it was all new, with Dodge finally getting a single-piece hood, opening to a full 90-degrees. Mechanically, a lot changed as well. The standard flathead six boasted 120 horsepower, now being the 230-cid unit from the previous generation. The optional V-8 was now a 204-horsepower, 315-cid unit. Behind them, the optional automatic transmission was the TorqueFlite, with push-button control on the left side of the dashboard. A major change was to nomenclature, as these trucks were referred to in several different ways. Internal to Chrysler, they were known as the K-Series, but they were also the first Dodge’s to be badged D100 through D300, in accordance to their weight rating, akin to Ford and International at the time. Sales and marketing of the era referred to this series as the “Power Giant” trucks, though that designation is rarely heard today. While the WDX-Series Power Wagon had been available since 1946, the 1957 K-Series became the first “regular” pickups to be available with four-wheel drive. 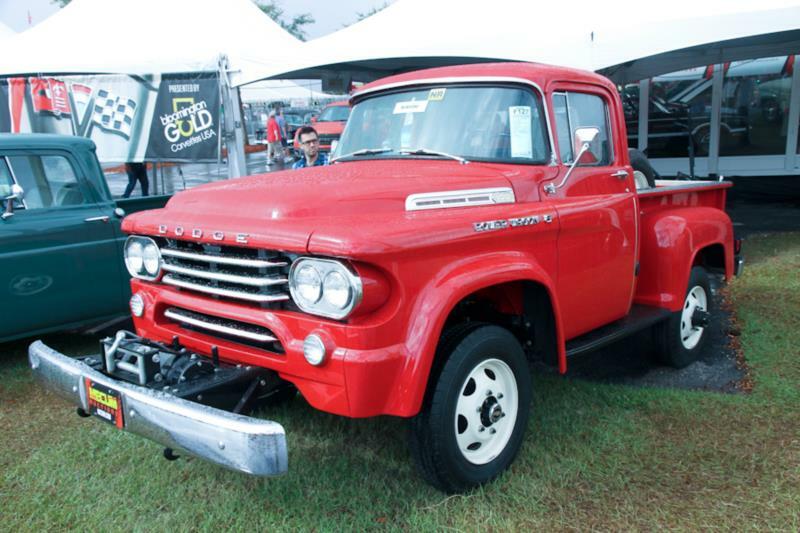 As such, 1957 was Dodge’s first ½-ton 4x4, the W100. To further confuse things, the original Power Wagons continued to be built, but the K-series 4x4 trucks also wore Power Wagon badging on the hood. Joining the industry’s four-headlight stampede was the 1958 L-Series. Only minor changes—most of which were mechanical, such as the V-8 now being the 318-cid unit—were made for the 1959 M-Series. This is until mid-year, when Dodge introduced the Sweptline full-width styled cargo box. 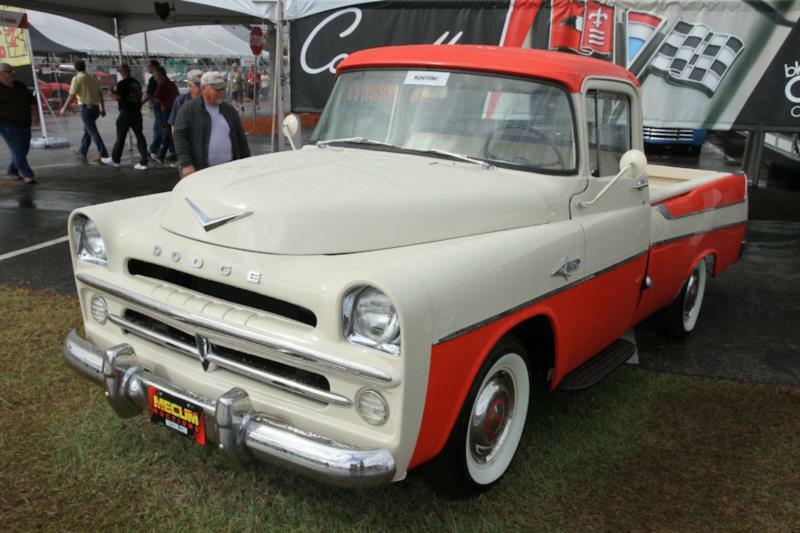 While this generation of truck was only offered in two basic trim levels, Dodge joined the styled pickup market in mid-1957 with the optional Sweptside pickup. Available in either trim level, the Sweptside was made by replacing the stock rear fenders with the rear quarter panels from the Dodge two-door station wagon. An expensive option when new (as they were custom fabricated), few were made and they were dropped when Dodge offered the Sweptline in mid-1959. 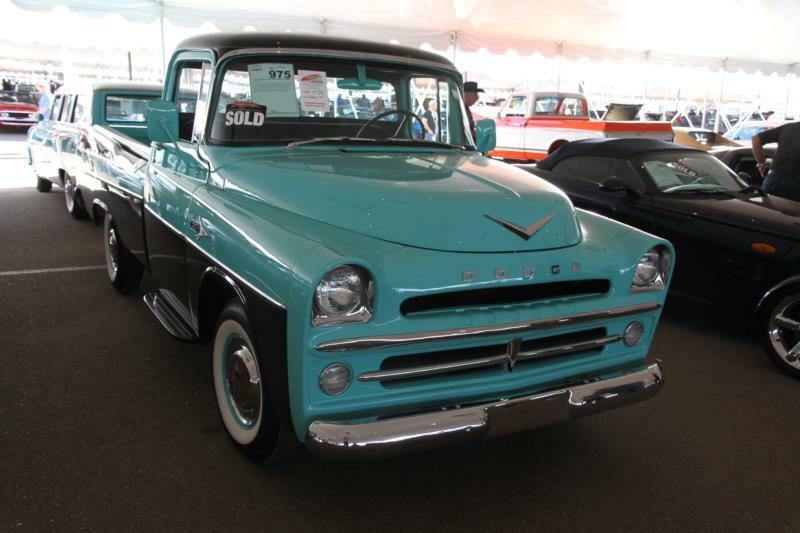 The final year for this generation was the 1960 1-ton P-Series trucks, once again with the usual grille and trim changes common to the industry.